The growth of the power and energy industry in recent years has been meteoric, and a significant amount of emphasis has been placed on the generation, conversion and distribution of clean and renewable energy. For the past 70 years, A&A Coatings has been supporting the power and energy sector with its unique and systemically evolved coating solutions. In order to grow the industry, we believe that the machinery components used by the different power and energy businesses must be protected from corrosion and wear so that no downtime will be incurred due to service outage. We can provide different types of coatings which range from dielectric coatings to abradable coatings so that your power generation equipment can be best protected as well as operate at their best efficiency. Our coatings are often used on a variety of applications in solar energy generation, solid oxide-fuel cells, industrial gas turbines and more. 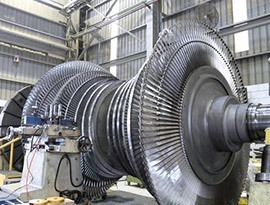 HVOF coatings and plasma spray coatings play an important role in the application of thermal barrier coatings (TBCs) for the repair of gas turbines. In the components of Industrial gas turbine, these TBCs are often applied to the hot zones. For smooth operations, corrosion and wear resistant coatings are also applied to the targeted areas. The power and energy industry has been benefitting from our unique coating and spraying solutions for more than half a century. From coatings on turbine rotors to fuel nozzles to compressor blades, we are committed to delivering the best coating solutions for our clients in the power & energy industry. To know more about the coating solutions offered at A&A Coatings, send us an inquiry today.